8:00 a.m. to 12 noon: After breakfast drive to Winery Square and stop in at the Smoky Mountain Angler (865-436-8746) to get fishing and fishing license information. You'll find everything you need, whether you're an experienced angler or novice. Bring your own gear or rent what you need. In Gatlinburg, you're allowed to fish in many of the city's stocked waters including West Prong of the Little Pigeon River, LeConte Creek, Roaring Fork Creek and Dudley Creek. There are also two designated children's fishing areas that are heavily stocked with trout. These are located at North Gatlinburg Park, at the northern Parkway entrance to the city, and Mynatt Park off Historic Nature Trail. No fishing is allowed on Thursdays when the city stocks its waters with trout. In Gatlinburg, only one hook is allowed. Corn and other bait is allowed except between December 1st and March 31st - which is strictly "catch and release." During this time, only single hook artificial lures and flies are permitted and all trout must be immediately released unharmed. The Great Smoky Mountains National Park is known for the native brook trout, brown trout, and non-native rainbow trout that inhabit it's streams and rivers. Gatlinburg and the National Park are crawling (or should we say swimming?) with over 900 miles of rivers and streams that are just waiting for you to cast your line. 12 Noon to 2:00 p.m: Have lunch in downtown Gatlinburg at the Smokey Mountain Brewery or Best Italian Cafe & Pizzeria and don't forget a snack in one of The Village Shops on the parkway. 2:00 p.m. to 3:00 p.m : Naptime! 3:00 p.m. to Dusk : Take a leisurely drive to Clingmans Dome to see the sunset over the mountains. There are many overlooks and trails to explore along the way. Too long a drive? I’ve got the answer: Roaring Fork Nature Trail ! The Smoky Mountain Roaring Forks Nature Trail starts at Stoplight #8 in Gatlinburg and ends only about a 1/2 mile from the Bear's Den's front door! 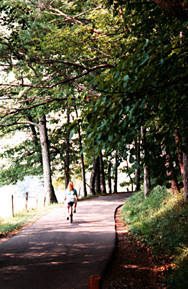 The Roaring Forks Trail is a one-way drive that will quickly give you and the family a feel for the Smokies. Sunrise to 10:00am: Go biking in Cades Cove - it's free if you bring your own bicycle. Beginning the second week in May, Cades Cove loop road is closed to motor vehicle traffic Wednesday and Saturday mornings from sunrise until 10:00 a.m. to allow bicyclists and pedestrians to enjoy the cove. This closure continues through the second-to-last Saturday in September. The 11-mile one-way road provides bicyclists with excellent opportunities for wildlife viewing and touring 19th century homesites. Bring your own bicycle and helmet or during summer and fall, you may rent bicycles at the Cades Cove store (located near Cades Cove Campground). For information call (865) 448-9034. 10:00 a.m. to 12 Noon Have a picnic lunch in the Cades Cove picnic area next to the stream. 12 Noon to 3:30 p.m. Drive to Townsend where you can rent inner-tubes and get directions for tubing the Little River. A relaxing way to end a great day. 4:45 p.m. to bedtime. Return to the cabin for dinner and a relaxing evening. Thanks to Jackson Mountain Homes for permission to reprint this series. Coming to Gatlinburg and have some time to plan but feel like you need a nudge in the right direction or suggestions on where to visit. We've prepared some terrific sample itineraries to help you experience some of the best experiences that Gatlinburg has to offer, from adventure to attractions, from dining experiences to shopping, and the exploration and enjoyment of the Great Smoky Mountains National Park. Just click on a title below to see the entire itinerary that might be just what you're looking for!